It was the Christmas season of 1963 when the Beatles agreed to star in “The Beatles Christmas Shows” at the Astoria Cinema in Finsbury Park, London. These shows had been arranged by the Beatles’ manager, Brian Epstein, and included several of his other acts including Billy J. Kramer and the Dakotas, Tommy Quickly and Cilla Black. These shows were, quite possibly, the oddest performances of the Beatles’ storied career. With over 100,000 tickets sold before the first show, financially, the performances were a guaranteed smash hit, but on an artistic level… well, let’s just say the Beatles were lucky the internet and social media didn’t exist back then. The basic outline was as follows: the Beatles perform a few songs, go offstage and dress up in ridiculous costumes while the other groups on the bill perform. Next, the boys perform a corny skit, a fluff “melodrama.” After the skit ended, the Beatles would again run backstage, take off the hokey outfits as other acts filled in, and come back onstage to eventually perform the show’s finale. The Christmas Show began on Christmas Eve, 1963. Then, the Beatles all went home to their families to celebrate Christmas. Strangely, after that, the “Christmas” shows continued through January 11, 1964. Amazingly, even after these questionable shows, and at a time when they certainly didn’t need the money, the Beatles again agreed to do “Another Beatles Christmas Show” in 1964. These included another series of juvenile skits. 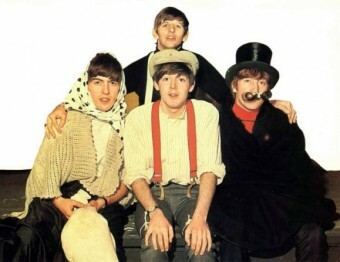 For instance, at the 1964 shows, John wore a blonde girl’s wig with pigtails, Paul and George each wore Victorian outfits, and Ringo wore a lion’s costume. I’ve got painting of Beatles signed Jasper I have had it since 1986 when living in Esher Surrey. Was Jasper John Lennon?